How aware were you of what your dad's writing career was like? How did you become aware he was a writer with a name that people knew? What was that like? Nancy: All I recall is a lot of typewriting and my friends asking and all I could say was he typing his notes. I had no idea what type of writing he did until my senior year in school. Peggy: I knew our dad was a writer of some sort but never realized his worth until after my teenage years. He provided well for the family [he was] very respected by those who knew him...we lived simple like everyone else in town. Joyce: As the oldest, I was probably the first to be aware of what was going on. I can't remember how I became aware of it, other than little whispers. I was proud of his talent but ashamed of the content. I was a real "goodie two shoes" (good grades, on my way to college, cheerleader, officer of many clubs in high school) and never brought it up in conversation. No one else did, either. I think that many people were surprised that I was such a contrast to the characters in his book. It is hard to think of your father as a sexual being when you are a kid. It is much easier to deny it. During the financial down times of your father's writing career, how did that change how he worked? Nancy: It didn't change him as he became more determined to write a book to publish for a check. Peggy: Dad was always at the typewriter and always producing one story or another. Down times gave him more drive, especially closer to the holidays as he helped others as well. Joyce: He just worked longer into the night and got up earlier. He was constantly on the phone, fighting for the money that he deserved and often took trips on the train to New York City to try to get his money. We only had one vacation in our entire family life. That was to the seashore in Maine. My younger siblings probably do not remember that. During the good times, we went out to dinner once a week as a family. As a teenager, I had the best car in town! He NEVER spent the money on himself! When did you first read your father's work? Could you see your father in the writing or was it like reading a stranger's writing? Nancy: My first book was in my senior year; by accident I found one and thought "oh MY". The book was titled "The Peeper" and I actually had to sneak reading it so I would not upset my parents. Yes, we can all pretty much tell his writing. Peggy: I have read three books. My dad did have one of a kind style. The first book i read was in senior year. Joyce: I never read any of it until I graduated from college. I admired the writing but was uncomfortable with the topics, as that is not what I read. It was particularly difficult when I recognized a disguised character or setting. How do you think of your father's writing now? He's an incredibly readable writer, but obviously much of what he wrote was for the "sleaze" market. What did that mean for your father? What did it mean, if anything, to the rest of your family? Nancy: Our father was brillant and born before his time, as now the writing is much more profane then what was acceptable then. We were very proud of our parents and they provided a home and a lot of love and understanding. Peggy: I never really thought of his books as being sleaze books...he wrote a lot about true life (just changed names and towns). Joyce: He often said that his work was mild, comparatively speaking. I did some proof reading and editing for him while I was in college. None of us supported the topics, though we supported the writer. We were a very conservative family, headed by a father with an imagination far-different from our way of life. In reality, he said that women would often approach him, thinking that he was as forward-thinking as the characters in his books. In reality, this was not his personal nature. That same "sleaze" label seems unfair today in light of how tame many of these books are relative to what's available in the media today. There's certainly a kind of flavor to these books even where the "sleaze" content is more situational than anything explicitly written. What do you think of that label, and how, if at all, do you apply it to your father's work? Nancy: Sleaze is just a word, but I take it in context of the past lingo that was used. I like to say that my dad wrote about love and lust which is in human nature, it just depends if you react to it. It is just a word. Peggy: Not sure how to answer this question--sleaze was not a word in our family. A lot of his more straight-up crime fiction books finish with a happy ending. Do you know, was this your father's notion, and if so, why he felt that his dark fiction should end so optimistically? Peggy: Most of the endings to his books were not known by anyone until he got there but as well some were pre planned. Joyce: He always wrote a story board for each of his characters, as well as the plot. That was the way he was - optomistic, looking for the happy endings! Recent months have seen more awareness and discovery of your father's work. Writers like James Reasoner have written quite a lot on his books, and hopefully this new volume from Stark House will expose even more people to his work. I'm sure this is gratifying, but is this important to you? How would your father feel about finding new popularity? Nancy: By all means it is important. He was a devoted father and husband and I just hope that he is smiling in heaven as he was never really appreciated by his work[s] of art with his words and stories. He would be so proud, as we are of him and always have been. Peggy: This is important to me as my father was proud of his work. He would be amazed at his new popularity and equally be amazed at the prices his paperbacks go for in today's market. If he were alive today to see this he would be at the typewriter pounding out another one, as he would say. Joyce: He would laugh about it, as well as be proud. He often thought that a movie contract would be on his way. He hoped that we would make a lot of money on the rights to his books, once people realized the quality of the writing. He was aware of people copying his books, his style; he never had the money to pursue legal action. If he had the money, he probably would have spent it on his family. He was not vindictive. He would be unhappy about the people who lack integrity with his works in the present market. Anything else you'd like to say about your father's coming back into print? Or on anything? Nancy: I just wish that he could have been recognized when things were tough. He always took pride in his work and he would only write the way he was comfortable with and when he was requested to be more uncensored he would not put his talent into that writing if at all. We have always been proud of his writing and all the books he had published and now it is wonderful that others see the talent and the writing he has created and I'm sure he has inspired many others. Peggy: Our father always had an open ear for not only family but friends. He never met a stranger as everyone became his friend as his winning smile would win you over. Dad had an understanding heart and a giving soul...he would give his shirt off his back, he never turned his back on you...our father had so many fine qualities you do not see in today's life...we are very excited to see his name in print as this brings our dad back to us in many ways from heaven. Love you, dad. Joyce: Our father never allowed his books to be distributed in our home town, in order to protect our family. As badly has he needed the money, the money was not worth what it could do to our family. I am just coming to terms with it myself. My husband feels that our dad was one of the brightest people he's ever met. He had plenty of stories and they enjoyed talking for hours! 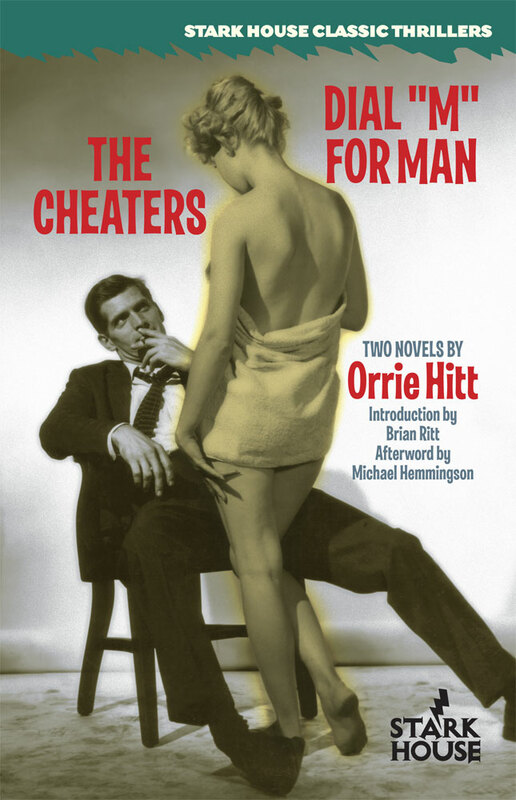 Orrie Hitt's The Cheaters / Dial "M" for Man available now! As a reader I've never been comfortable with the sub-genre most commonly known as "sleaze." I remember spending time in a bookstore in downtown Minneapolis and right next to the bins of bagged and boarded comics was the "adult" section, containing low to the floor racks filled with paperback books, many with the covers torn off. I think these books were something different but my whole life I've had a difficult time distancing this image from, say, books with covers that contained less than mainstream subject matter. As time brings to light the many well-known authors who wrote these books, and the reasons they did so, I've found my prejudice weakening. And when I first read Robert Silverberg's brilliant introduction to the recent Stark House "Don Elliott" release, not only did I not mind cracking certain covers, I looked forward to it with a kind of open lightheartedness I didn't know I could manage. The name of Orrie Hitt was one I've long been familiar with, but always associated with those kinds of books. But he was a fine crime fiction author as well, forget the "sleaze" element, and recent writings by people like James Reasoner have helped bring this to light. Perhaps had he used a pseudonym for these books, like many of his peers, his own name would rank higher among the pure crime fiction novelists of his time. I hardly think it would be otherwise. This week, in honor of our first Orrie Hitt release, I spoke with his three daughters about their father and their own exposure to his work. We often hear about a writer's work habits or opinions but here we have a chance to hear about a wonderful writer from the people who knew him best. It's a unique opportunity for a peek behind the scenes of this one-man fiction factory, the inimitable Orrie Hitt. So as always, if you're not a member of our Crime Book Club, sign up now to get each book shipped to you automatically and take advantage of the special discount for new members to fill out your collection of back list titles.